Manitoba has seen many flags including those of Denmark, Great Britain, France, the Hudson's Bay Company and the Métis. 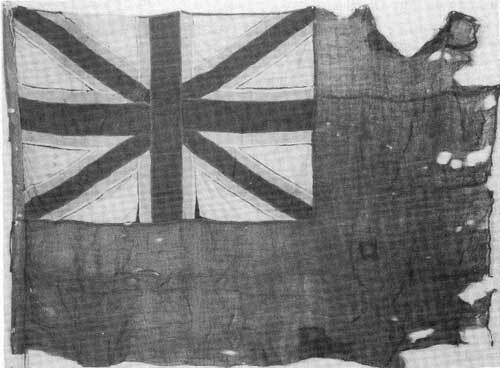 Canadian patriots, under the leadership of Dr. John C. Schultz, raised an improvised version of the Canadian Ensign over the Red River Settlement in late 1869. Rev. A. G. Morice, the Oblate Historian, described it as a "Union Jack with the word Canada stitched across it". Louis Riel replaced this flag with that of the Provisional Government on 10 December, 1869. This was, perhaps, the most controversial flag to date. Descriptions of it vary with each chronicler and none of these match up with the flag shown in the St. Boniface Museum. Kildonan also had their own flag during the uprising. It was a large ensign with the words "God Save The Queen" stitched across it. After Manitoba became a Province, the Canadian Red Ensign was used throughout Rupert's Land. The earliest known date apparently is 1 July, 1869 when the flag was hoisted at Red River. The flag shown here does not match any of the known descriptions. It is obviously old and measures 8' long by 5' wide. The main colour is red but the unique thing is the presence of a Union Jack in the upper corner in which all the blue has been very carefully removed and replaced with white linen. This very nearly resembles the flag shown in Lord Selkirk's drawing of Fort Douglas. A newspaper report describes this flag as being used by Sheriff Inkster at the unveiling of a cairn in 1927 and mentions that it was made by Canadian soldiers and flown over Fort Garry when they occupied it after the uprising. It is obviously a home-made flag, but the removal of the blue triangles remains a mystery. Miss Sybil Inkster recently donated the flag to the Manitoba Museum of Man and Nature but she was unable to provide us with any additional information. Does anyone have suggestions as to the origins of the flag? According to some authorities, the union flag of Great Britain was displayed for the first time on March 24, 1603, at the accession of James I. Other authorities, however, give 1606 as the year in which official recognition was granted by Royal Warrant. This flag had the red cross of St. George (England), with its horizontal and vertical members, superimposed on the diagonal white cross of St. Andrew (Scotland), with its blue field occupying the eight triangular segments between the four arms of the two crosses. In the mystery flag on this page, it is the blue segments in the cross of St. Andrew which have been covered with white linen. In addition, while the white Scottish (diagonal) saltire remains, it is indistinguishable from the (white) fimbriation (bordering) of the cross of St. Patrick, which was added to the Great (Grand) Union flag in 1801 when the union with Ireland was consummated. To combine the three crosses in the new Union Jack without losing their identity was no easy task. Each had to be distinct and each had to retain its bordering which denoted its original ground. The difficulty was resolved by making the white broader on one side of the red than on the other, the white cross of St. Andrew being designated by the broad saltire, and the white bordering of the cross of St. Patrick by the narrow white fimbriation. Both these elements are missing from the mystery flag, or, put another way, one is lost in the other, for the diagonal white bands are all the same width. Why eliminate the cross of St. Andrew from a Union Jack at Red River - of all places? It may be recalled that at one point during the Riel Uprising (1869-1870), the Kildonan Scots took an independent stand, declared their loyalty to the Crown, and stood aloof from the latter liaison (?) between the English half-breeds and the Métis. Was there someone among the Kildonan Scots who became so incensed at this time at the apparent rejection of the Imperial connection and the establishment of an independent government at Red River that he rose in anger and struck the ancient and honourable cross of St. Andrew from the flag of the dissident Sassenachs? All theory, of course, but as Mr. Stanton puts it: Does anyone have a suggestion as to the [real] origin of this flag?